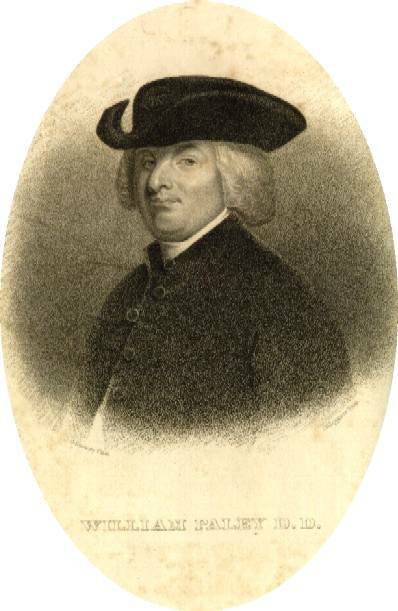 William Paley was the originator of the theory now known as “creationism,” the idea that the world as we experience it was created by the Judeo-Christian God in an act of divine fiat, and act which is described in detail in the first book of Genesis. For Paley “let there be light” (fiat lux), the firmament, the fish of the sea, the fowl of the air, man (Adam) and woman (Eve), and the tempting serpent (Satan / Lucifer) in the Garden of Eden are all matters of scientific fact that reveal the precise origin of the natural world and the precise characteristics of God. Cambridge University required students to read his A View of the Evidence of Christianity (1794) until the twentieth century. Both John Milton and Charles Darwin were graduates, along with Paley, from Christ’s College, Cambridge. His most famous and influential work was Natural Theology: or, Evidences of the Existence and Attributes of the deity, Collected from the Appearances of Nature (1802). 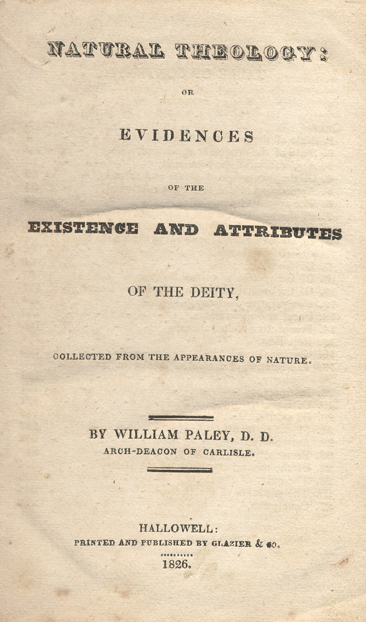 As the title suggests, this is the work in which Paley argues that the characteristics of the omnipotent and omniscient creator can be understood through careful attention to the details of the natural world around use. If nature seems kind, then God is kind. If nature can be cruel, then God can be cruel. Paley never explains how to reconcile the apparently contradictory aspects of nature: beauty and ugliness, delicacy and harshness, health and illness, birth and death. Why does a killer-whale “play” with the seal it is killing before finally eating it? Why is an innocent infant as likely to contract polio or leukemia as a sin-ravaged adult? Paley finally says, simply, that the amount of good in the universe outweighs the amount of evil. He also clearly suggests that all of the unexplained mysteries and complexities we find around us are part of the Mosaic God’s divine plan for us and for the universe. The marks of design are too strong to be got over. Design must have a designer. That designer must have been a person. That person is GOD. The logical details of his premises, however, are never questioned. It is no more necessary that design must have a designer than that light must have a “lighter” or that dark must have a “dark-maker.” Nor is it at all essential that what looks like design is, in fact, design. The wind can blow a stack of matchsticks into a pattern that looks like a human face or an hour-glass, but that “face” or “hour-glass” had no necessary planner, no essential designer. Christianity, and his Moral Philosophy [. . .] The logic of this book and as I may add of his Natural Theology gave me as much delight as did Euclid. [. . .] I did not at that time trouble myself about Paley’s premises; and taking these on trust I was charmed and convinced of the long line of argumentation. Two important Darwinism ideas do have links to ideas proposed by Paley: first, that each organism is somehow “fit” for its environment and, second, that the structure of an organism is closely linked to the functions it performs. For Paley, of course, this fitness and such linkage are carefully planned by God; for Darwin, we need only the laws of natural selection to account for even the most complex organisms and even the most remarkable natural functions.